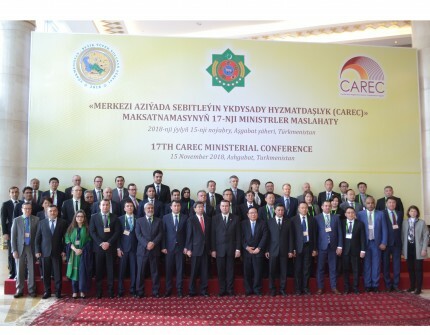 On November 15, 2018, 17th Ministerial Conference on Central Asia Regional Economic Cooperation (CAREC) started its work in Ashgabat. High-level government officials from the Republic of Azerbaijan, Islamic Republic of Afghanistan, Georgia, Federal Republic of Germany, Republic of Kazakhstan, People’s Republic of China, Kyrgyz Republic, Mongolia, Islamic Republic of Pakistan, Republic of Tajikistan, Republic of Uzbekistan, and Japan, as well as officers from such international organizations as ADB, WB, EBRD, GIZ, IMF, JICA and others have arrived in the capital city of Turkmenistan to attend the conference. The Deputy Chairman of the Cabinet of Ministers Turkmenistan and Mr. Takehiko Nakao, the President of ADB delivered keynote speeches at the opening ceremony. Then, signing ceremony of loan agreement took place.